It might be a new year, but the world is just as strange and silly as ever. That’s why this list is here to present you some of the oddest stories that made the headlines this week. What better way to start off 2019 on Listverse than to talk about mysteries and aliens? There’s been a new development regarding a classic incident referred to as the “British Roswell.” We also learn about two scientists who claim that the oldest person ever was a fraud. There are also two stories involving creepy-crawlies, and yes, they’re both from Australia. A new source claims that the Rendlesham Forest UFO incident back in 1980 was a revenge prank by the SAS played on the US Air Force. 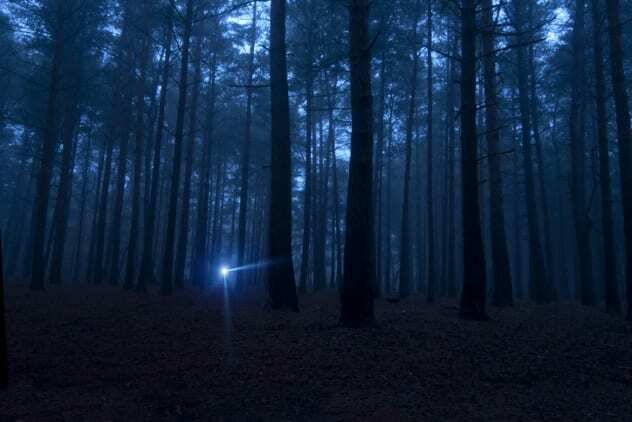 Between December 26 and 28, 1980, there were multiple reports of weird lights spotted near Rendlesham Forest in Suffolk, England. These reports came from members of the United States Air Force who, at the time, were stationed at nearby RAF Woodbridge. They even included a memo from the deputy base commander, Lieutenant Colonel Charles Halt. Obviously, people claimed it was a UFO sighting. The incident became famous and is informally referred to as the “British Roswell.” However, journalist and ufologist Dr. David Clarke now claims an unidentified source within the SAS says the whole thing was a prank orchestrated by British special forces. After they were released, the SAS soldiers started planning their revenge. They waited until December and then rigged the woods with flares and lights attached to black helium balloons and remote-controlled kites. They probably weren’t expecting the whole thing to grow as big as it got. It was helped by the fact that the memo and audiotape of the investigation recorded by Lt. Col. Halt were later made public under the Freedom of Information Act. A dig for a new luxury hotel uncovered a 13th-century catapult ball used during the Wars of Scottish Independence. The site is in Edinburgh and is earmarked for a new Virgin Hotel. Before construction begins, an archaeological dig has been set up. The excavation has been ongoing since May and had previously found traces of prehistoric bones and the earliest homes built in the city center. 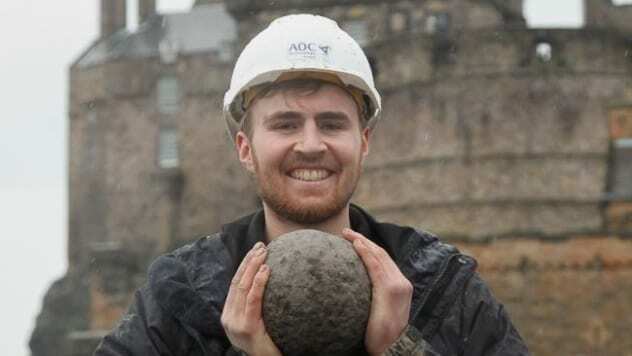 Now, however, archaeologists have found a ball believed to have been fired from a trebuchet during a siege on Edinburgh Castle. Back in 1296, King Edward I invaded Scotland and started the First War of Scottish Independence. The siege on Edinburgh Castle only lasted for three days before the English seized the stronghold and held it for 18 years. Researchers are very excited over the ball, which they believe came from that event. It is not often that archaeologists can date 700-year-old artifacts with that kind of precision. 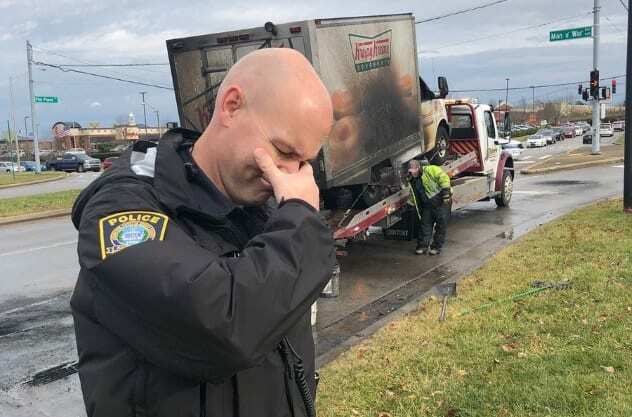 The Lexington Police Department in Kentucky has taken to social media to mourn the loss of a doughnut truck which was destroyed in a fire, along with all of its contents. No persons were injured in the blaze, but that does not mean there were no victims. The truck’s entire supply of Krispy Kreme doughnuts perished in the fire. The cause of the flames has not yet been established, but the driver noticed smoke billowing from the back of the vehicle as he was driving through Lexington. Obviously relieved that nobody was hurt, police officers posted photos on Twitter to express their pain at the loss of their favorite nourishment. Other police departments heard of the “tragedy” and have reached out to extend their condolences. After the story went viral, Krispy Kreme also contacted the Lexington Police Department and vowed to send officers a few dozen doughnuts to help ease their suffering. 7 Are There Vampires In Poland? With a new year upon us, the UK Foreign & Commonwealth Office (FCO) thought it would be amusing to release some of the weirdest and most amusing requests and questions their consular staff received from Britons abroad. In 2018, the Foreign Office got over 330,000 calls for help. As you might expect, a lot of them were boring and bureaucratic, but there were also a few quirky gems. For example, a man in Poland called to check if there were vampires in the country. He became concerned when he was due to go on a date with a woman who asked him his blood type. One person in the United States missed Strictly Come Dancing the previous night and phoned up to inquire who got voted off. Similarly, a caller in the Netherlands had just seen Braveheart and ringed the Foreign Office because they had questions about the plot. Someone in New Delhi wanted to visit the British Embassy to buy vegetarian sausages. A caller in Italy wanted tickets to see the Pope. A man asked for a list of Argentinean women available for marriage. A Brit on holiday in the Canary Islands had a real crisis when a stray cat snuck into their hotel room and peed on their bed. A spokesman for the Foreign Office regretfully confirmed that the department has no advice or help to offer regarding “vampires, stray cats or Strictly contestants” but still encouraged Brits abroad to contact them should they need assistance. Australian police responded to screams coming from a house in Perth, only to burst in and find a man trying to kill a spider. A person was walking down the street in the Wanneroo suburb of Perth when they heard noises coming from a house. These included a toddler screaming and a man’s voice repeatedly shouting, “Why don’t you die?” Distressed, the passerby called the authorities. Not wanting to take any chances, multiple officers responded to the call. Inside the house, they found a man who was trying to kill a spider. 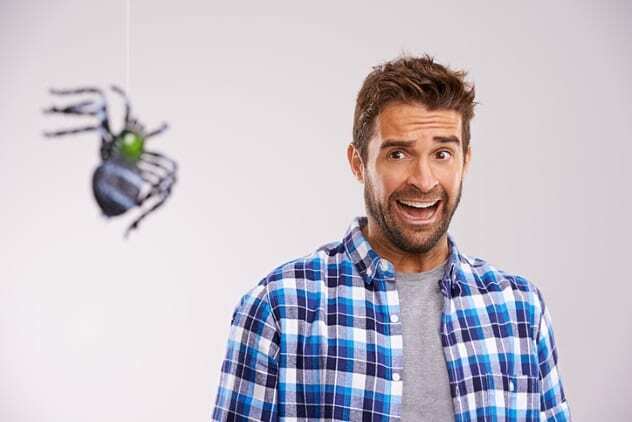 Embarrassed, the resident apologized for the inconvenience and stressed that he had a “serious fear” of arachnids. Police on the scene reported that there were no injuries, except for the spider. 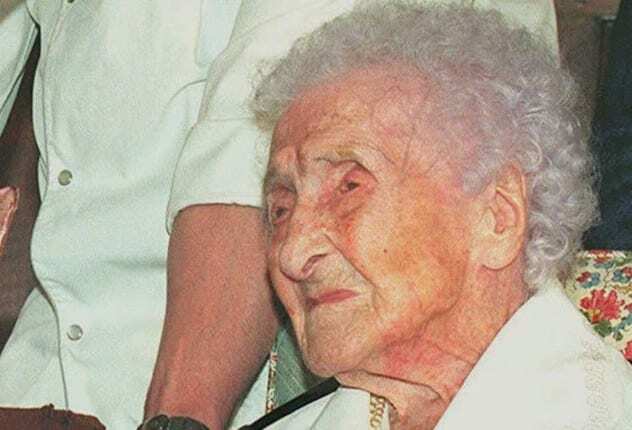 Researchers have brought into question the record-setting claim of Frenchwoman Jeanne Calment of being the longest-lived person ever. Jeanne Calment was born in 1875. She died in 1997, aged 122 years and 164 days. That still remains the record for the oldest human in recorded history. However, two Russian scientists beg to differ. Mathematician Nikolai Zak and gerontologist Valery Novoselov have spent months researching the interviews, biographies, photos, and records regarding Jeanne Calment and came to the conclusion that this was a case of identity theft. Specifically, they say that Jeanne’s daughter Yvonne assumed her mother’s identity. This would have happened in 1934. According to official records, Yvonne died of pleurisy. However, the two researchers believe that it was the real Jeanne Calment who actually passed away, and her daughter pretended to be her to avoid paying inheritance tax. If this is true, then Yvonne would have been 99 years old when she died—a long life but not a record. As evidence, the scientists presented multiple physical discrepancies between Jeanne before the 1930s and her in later years: height, eye color, position of her forehead. There is also the report that when she began to become famous, Calment burned a lot of her photos from her younger days. The study has caused plenty of controversy, with some slamming it and others praising it. If the scandal persists, there is a surefire way of finding out the truth, as both the bodies of Jeanne and Yvonne Calment could be exhumed and DNA-tested. 4 Are Cane Toads Lazy Or Horny? 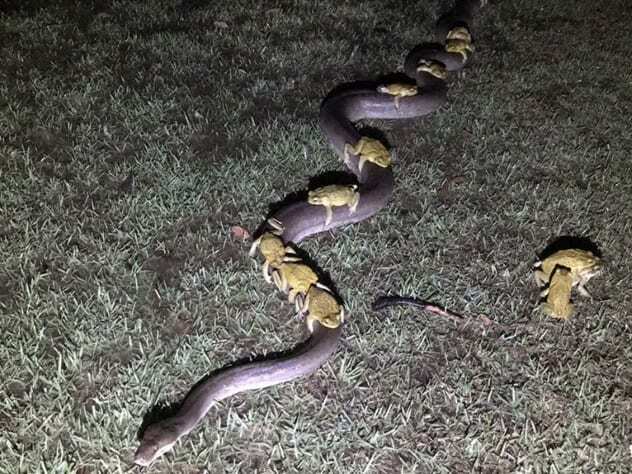 The Internet is abuzz after seeing images of cane toads hitching a ride on top of a 3.5-meter (11.5 ft) python. A thunderstorm hit Kununurra in Western Australia last Sunday night. It brought around 7 centimeters (2.7 in) of rain in just one hour. After it was over, local resident Paul Mock went outside to check the property and noticed that a nearby lake had overflowed. Consequently, numerous cane toads were now trying to flee the rising waters. Some of them had found an interesting alternative mode of transport—they climbed on top of a snake. According to Paul, the reptile’s name was Monty, and he was a regular who always hung around the lake and occasionally scared his wife when she went to hang up the laundry. However, he had never seen Monty serve as a shuttle for toads before. Paul took some photos of the curious scene and shared them with his brother, who then posted them online. Many people were amazed by the images, and some were incredulous and thought they might have been staged. Biologist Jodi Rowley offered an alternative explanation for the phenomenon. She said that male cane toads can get a bit carried away when they are feeling frisky and opined that the amphibians were actually trying to mate with Monty. What would happen if four Florida Men got together? They would either form a modern version of the Justice League or, more likely, try to steal half a million dollars’ worth of tequila. Sunday night, a trucker driving through Tampa stopped for dinner. When he returned to his vehicle, he realized that someone had absconded with his semitrailer. The driver notified the police, who later found the stolen trailer along with the thieves. 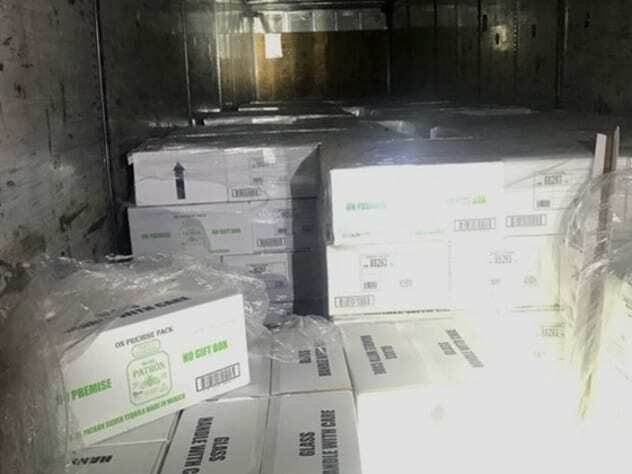 Deputies caught Vidal Estrada, Humberto Ramirez, Lemuel Escobar, and Alberto Obaya in the process of transferring the stolen goods into a box truck registered to them. They had already moved around 20 cases of booze and only had around 950 to go. The total value of the premium Patron Tequila they purloined was over $507,000. All four men were charged with grand theft, burglary, and resisting an officer without violence. One of them got a bonus charge of possession of a controlled substance. Mexican archaeologists say they have uncovered a temple to Xipe Totec, the pre-Hispanic “Flayed God.” His priests worshiped him by flaying human sacrifices and wearing their skin. 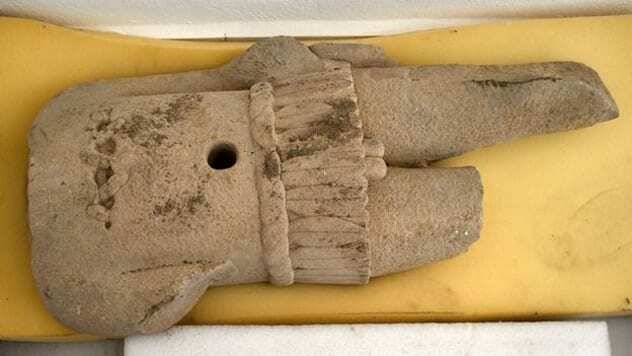 The discovery was made at a dig site in Puebla while excavating ruins of Popoloca natives. Scholars think it could be the oldest dedication to the god ever found in Mexico. Artifacts recovered include two large 200-kilogram (440 lb) skulls made from volcanic stone and an 85-centimeter (33 in) ceramic effigy of Xipe Totec. Archaeologist Noemi Castillo says the sculpture has a hole in its belly where a green stone was placed during ceremonies and a right hand hanging by his left arm to symbolize the dangling skin of a human sacrifice. The items from the site were dated to AD 900–1150 based on the age of the temple, but they have been sent to a lab for further analysis. Archaeologists are not convinced that this was once the site of human sacrifices. If Aztec sources are to be believed, the rituals were performed in one place, but the skins were stored in another after being worn for a few days. This temple could have been the latter. 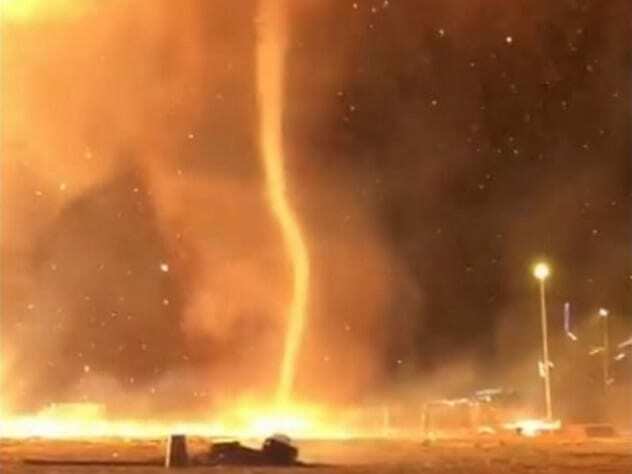 New Year’s Day revelers at Scheveningen seaside resort in the Netherlands had a unique and unplanned addition to their celebrations—fire tornadoes. Every year at the resort, it is tradition for partygoers to have a bonfire on the beach. This year, however, the conditions were just right to cause a phenomenon known as a fire whirl or, sometimes, fire tornado. Erratic winds were strong enough to carry the blaze into a vortex almost 50 meters (160 ft) high. While the fire whirls themselves soon dissipated, sparks and embers were carried by the winds onto the nearby roads, hills, and buildings. Firemen on the scene had to keep the adjacent structures constantly wet so that they would not catch fire from an errant spark. Riot police were also on hand to ensure that the firefighters could do their job without interruptions from disgruntled or inebriated revelers. Even so, a few small fires still appeared and caused some minor damage, but they were all successfully extinguished. Read more offbeat stories you might have missed from December 29, 2018, and December 22, 2018.